The Tutukaka kiwi whanau has been enriched by three new additions with the release of Kim, Harry and Fomli at Tawapou within Tutukaka Landcare’s 10,000 hectare predator controlled area on October 24th. Emma Craig shows Fomli the kiwi prior to her release. Photo: Malcolm Pullman. 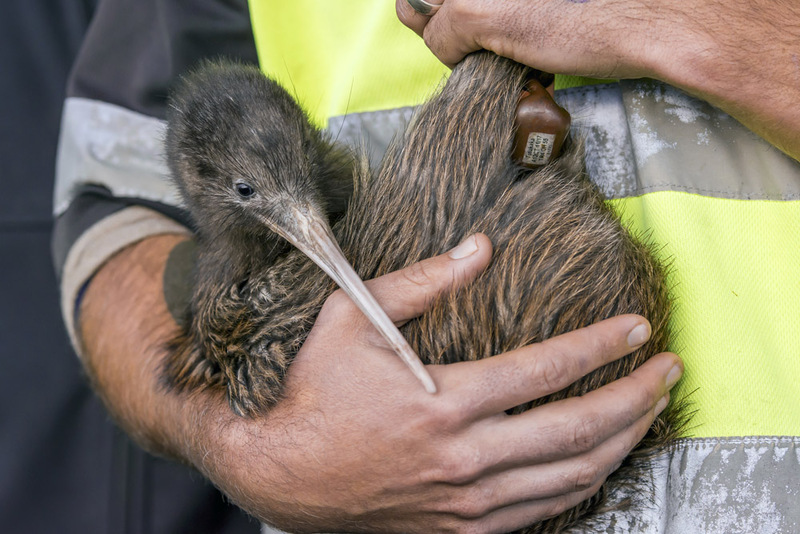 The three kiwi had a big day being ambassadors for their kind, beginning with being removed from their island burrows at dawn by the ‘kiwi catching crew’ Todd Hamilton, Emma Craig, Cam McInnes and Ngaire Sullivan. After a health check they were ferried over to the mainland where they met Onerahi locals during a whakawaatea ceremony performed by Te Parawhau kaumatua Fred Tito. After resting, they then visited Ngunguru School where they entranced 200 students and helped drive home messages about the need for good dog control and ongoing predator control to ensure their survival for another 50+ years in the wild. An afternoon nap, and then it was the big event – meeting the 160 strong crowd at Tawapou and giving each a precious up-close kiwi encounter. While the kiwi genetics are carefully checked by the Department of Conservation prior to each kiwi’s translocation, some of the kiwi released will be joining members of their extended family who were previous graduates of the Matakohe-Limestone Island kiwi creche and also released out at Tutukaka. Fomli the kiwi for example, is the great-grandaughter of Johnny a very successful breeder who contributed many chicks to the island before unfortunately being killed by a dog in 2008. Fomli was named after the community group that manages the island creche – Friends of Matakohe Limestone Island or FOMLI. Island ranger Emma Craig said Fomli has moved around the island quite a bit since being fitted with a transmitter a couple of weeks ago, and her loud, rasping calls could be heard most nights. Harry was the oldest of the kiwi released at four years of age. Emma remarked “Harry should be right on the cusp of breeding, so it’s a great time for him to graduate from the island creche and start increasing the Tutukaka kiwi population!”. Each kiwi was fitted with a transmitter so that their movements could be monitored over the upcoming months as they settle into their new homes, explore the Tutukaka Coast and hopefully establish territories and find mates. 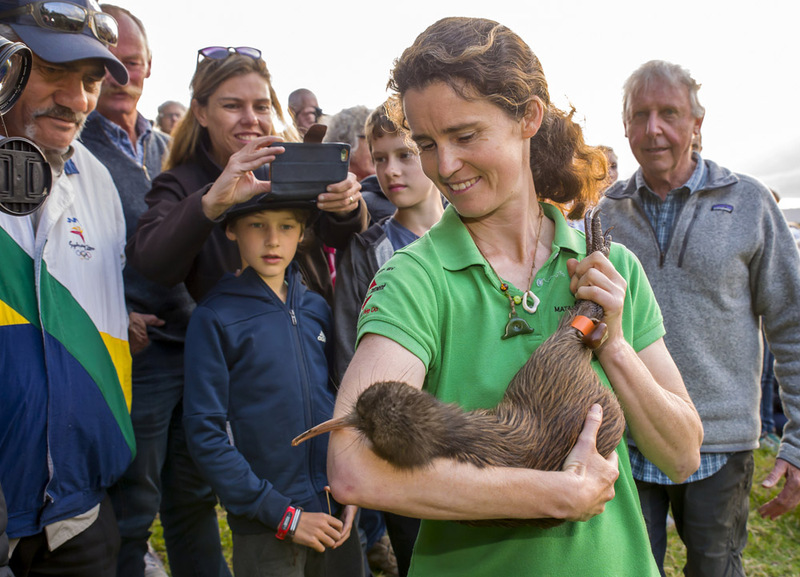 The Tutukaka kiwi release events were made possible by funding from the Kiwis for Kiwi Trust, Kiwi Coast and Northland Regional Council. 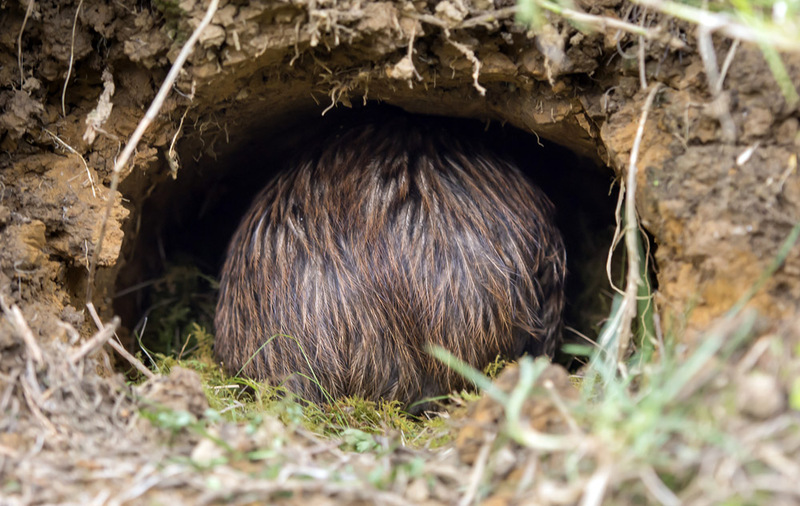 Kim the kiwi safe in her pre-made burrow, finds her happy place by ignoring her kiwi fans! Photo by Malcolm Pullman.